FOR EVERY PAIR SOLD, PLANET FLOPS WILL PLANT A TREE IN THE BRAZILIAN RAINFOREST! Through our partnership with Trees for the Future, Planet Flops will gladly plant a tree in the Brazilian rainforest for every pair purchased! We call it, simply, "Buy One, Get One Tree." Learn more about Trees for the Future below. Trees for the Forest is an agroforestry resource center, working with people to improve livelihoods and restore degraded lands to sustainable productivity through planting beneficial trees. Planting trees in agroforestry systems provides a myriad of benefits, such as food; forage for animals; sustainable fuel wood and construction materials; increased agricultural yields; improved water infiltration and aquifer recharge; and protection of soils from wind and water erosion. However, planting trees can be difficult when the canopy has disappeared, topsoil has been eroded, and the climate and growing conditions have changed. Through our network of technicians, volunteers, and community leaders world-wide, the program reaches out and provides the knowledge and ability to rehabilitate the environment. Since 1988, Trees for the Future has helped thousands of communities in Central America, Africa, and Asia improve their livelihoods and their environment by planting nearly 65 million trees. Trees for the Future calculates that these trees remove over one and a half million tons of CO2 from the atmosphere each year. 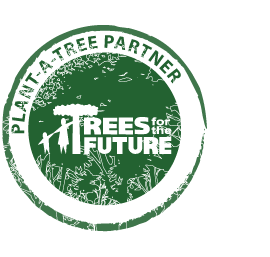 Trees for the Future is also active locally, educating students and communities about global issues, our role in the environment, and energy efficiency.